Picture this: Your name is Smokey Lynn and it’s the winter of 1949 and your life long dream to be a professional singer is finally coming to fruition. The style of music that most suits your skill-set is in its second year of existence and you’ve been signed to an up and coming independent record label in Los Angeles that already has a decent track record for scoring hits in the black community. In the month of February you enter the studio for not just one but TWO sessions that result in eight sides being cut. Though obviously you can’t control the public’s response to the work, you are relatively confident about what you laid down and sure that you are on your way to stardom. But a funny thing happened on the way to the Rock ‘n’ Roll Hall Of Fame… Lynn’s chances were practically sabotaged by Specialty Records who made a series of utterly bewildering decisions as to his releases. First they put his strongest cut, State Street Boogie, out on a record credited to Don Johnson’s Orchestra (Johnson being the trumpet playing leader of the band whose contributions to that song are decidedly minimal). For the flip side they used one of the cuts that didn’t even feature Lynn, but rather was an instrumental (Jackson’s Blues) highlighted by tenor sax Earl Jackson’s work and somehow that one became an unlikely, albeit minor, hit. The very next month they put out the first release under Lynn’s own name… except the A-side, Run Mr. Rabbit, Run, had no contributions by Smokey Lynn himself, as it was sung by Larry Costello who was given the “featuring…” credit. So much for propelling Lynn’s career into orbit with these two releases. All that was left for poor Smokey Lynn, or Smilin’ Smokey Lynn as he was known, was a downcast B-side that had little chance to appeal to anyone. Obviously the “Smilin” moniker was either a joke at Lynn’s expense or merely a cruel reminder for him to laugh to keep from crying. It’d be hard to find a more disparate recording to the Costello-led top side amongst those cut at the two Lynn sessions than Lonesome Lover Blues. 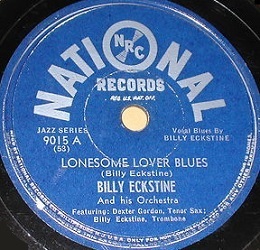 Written and first cut in 1945 by Billy Eckstine, the one indisputable black star of the 1940’s crooner brigade, and featuring a whimsical solo by sax legend Dexter Gordon along with some heavily accented drumming it had been a Top Five hit for Mr. B at a time when there were just five spots on the Race Charts. Though the horn section as a whole was emblematic of the era which definitively dates it as being squarely in the mid-40’s mindset the whole arrangement of the song was actually taken at a much livelier tempo than Lynn attempts four years down the road. It certainly was a song that would’ve been adaptable for rock with a bit of re-working, muscling up the horns, maybe adding a call and response vocal, but Lynn and company treat this instead like a chance to take this even further back stylistically, dropping the pace and ramping up the anguish. Because of that we have to admit that this was a side that we easily could’ve skipped over altogether. It’s on the far fringes of rock and had better hope no bouncers are there asking for ID or they might get tossed out on their ear, but we’re feeling generous because of Lynn’s rotten luck when it comes to how Specialty handled his career so we’re including it just to give him a chance to actually be reviewed for a song that came out under his name that he himself actually gets to sing. On the other hand that might not be doing him any favors either. The first thing that jumps out, even if you’re not familiar with Eckstine’s original, is the crawling pace and morose sentiments, something hardly suited for Lynn’s persona. He’s forced into acting despondent, practically on the verge of suicide by the sound of it, and its slow tempo and forlorn vocals are in stark contrast to the wired intensity of Costello’s race to the finish line on Run Mr. Rabbit, Run. If Specialty Records hadn’t shown their ineptness leading up to this I’d say obviously this was intentional on their part, pairing two dissimilar sides to give listeners a very distinct option. But while “Rabbit” was ultimately TOO frantic once you studied it closer and by the third or fourth spin it lost a considerable amount of its initial appeal, at least it HAD initial appeal to make it worth picking up. Lonesome Lover Blues may have nothing particularly wrong with it, but it also has nothing to make you sit up and take notice. When record buyers put on the A-side for the first time their hearts would begin to race. When they flipped it over they soon checked their pulse because they assumed they had died from overexertion and this was just the elevator music on their way down to hell. The usual suspects are at fault here, the droning horns, the plinking piano, the lazy drumming, and while it fits the song’s content to a degree the song itself doesn’t fit the context of the era or style we find ourselves in, and certainly doesn’t suit the boisterous attitude that Smilin’ Smokey Lynn was most comfortable in. The lyrics are no better in this regard offering up a tale of woe that provides no juicy anecdotes as to what led him to this stage. He wakes up already in a state of despair after his girl took off during the night. But rather than rail about her treachery, or recount their last days and nights together to find where things went wrong, or even – if he wants to pine over her – to sing her praises when remembering the good times they had together when presumably she was a willing and eager partner for him, Lynn instead just moans over her loss while his breakfast gets cold and our patience grows thin. There’s no sympathy he’s engendering with his pitiful cries of despair. No resolution in sight as there’d be if he hastily got dressed and went out looking for her, either to beg for her forgiveness or cut her throat and dump her in an alley. There’s no chance for him to rebound by going out and grabbing himself the first warm halfway decently shaped body he sees to get over his misery. Instead this is somebody you feel you have to hide the razor blades and take his belt away from and will have to call in to his work to tell them that he’s probably not going to be coming in today since he’s still in his pajamas and is up to his ankles in tears. I know he didn’t write the song so that’s hardly his fault and I suppose you can say he’s effectively embodying the grief the lyrics require while the accompanying music is dutifully going along with his anguish but without a deeper plot, without any sense of progress in the storyline and without any moments – be it musical or vocal – to stop you in your tracks there’s really no compelling reason to give yourself over it. Not in rock ‘n’ roll circa 1949 anyway. Lonesome Lover Blues isn’t a complete train wreck, he’s doing the best he can with the material he’s been given, but it’s simply the wrong song at the wrong time for the wrong artist in the wrong genre. This type of thing was never what Lynn was going to make his career on so why on earth would you take someone suited for high octane rockin’ and saddle him with something lethargic musically, contemplative lyrically and affixed to an arrangement that fell out of favor at least a year and a half earlier? Furthermore why would you pair it with exactly the type of song he WAS born to sing yet isn’t given the chance to do so because some interloper named Larry Costello was allowed to cut the more suitable track (although of course Costello himself wrote it, thereby explaining why he also sang it), even though Specialty 327 was supposed to be a Smokey Lynn release. Considering the label wasn’t exactly teaming with stars by this point perhaps giving EACH one a two-sided release of their own, this time as well as last time out for Lynn, would’ve been much smarter. Instead all you can do is shake your head and roll your eyes at their shooting themselves in the foot, then reloading and shooting themselves in the OTHER foot for good measure! Oh well, it’s not OUR feet, but try telling that to poor Smokey Lynn. What makes this all the more frustrating, both at the time for Lynn I’m sure but also for us here and now, is that Smokey Lynn had material in the vault that was far more suited for the rock world of mid-1949. Check out the above release Shouting The Blues (as on every page click the cover art and buy the associated albums through Amazon to give us the whopping 24 cent commission to keep this site loaded with the dazzling extras you see on every page!) for the far better material Lynn cut for the label that remained unreleased. Feel Like Ballin’ Tonight may not be very original, it’s basically the Good Rocking Tonight prototype refitted for his own needs, but would that really matter if it gave audiences more of what they craved? Or for that matter gave audiences a glimpse into Lynn’s better vocal attributes which might make him more appealing down the road and cause listeners to at least seek him out later on to see if he could do the same with slightly more original material. The intrusive Dixieland horns on Rock-A-Bye Baby probably would kill that song’s commercial potential anywhere outside of Louisiana but at least its title and Lynn’s performance were more suited to the landscape we find ourselves in now and might’ve positioned him better going forward than an outdated bluesy lament. Most appealing of all from his unreleased sides was Hometown Baby (Hip Cat) which may be housed in a fairly rudimentary rock structure but at least has a quality story, some sharp lyrics and a rousing vocal by Lynn, even if once again he’s weighed down ever so slightly by the more archaic horns he’s saddled with. The point is ANY of those songs were far more suited to bolstering Lynn’s standing amongst the rock crowd than Lonesome Lover Blues, which even if you find it to be an authentic lament to mildly recommend you’d have to agree that it had no chance at finding a broad audience in this field. Since all of his other vocals were uptempo boisterous performances then why would you as a record label waste your time with something that was completely unrepresentative of his best attributes, not to mention pairing it with something that WAS more appropriately outlandish but sung by somebody else entirely? 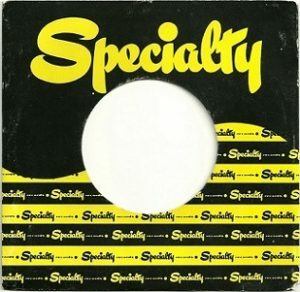 Remind me again how Specialty Records even lasted until the 1950’s let alone helped to shape that decade musically as much as any label when THIS was the type of business acumen they showed early on?!? None of this lengthy diatribe in 2018 over inane decisions made sixty-nine years ago helps Smokey Lynn’s career prospects in 1949. He goes down in the history books as barely a footnote in rock’s story, the vocalist on one great record (State Street Boogie) which itself was credited to a trumpeter who will be eternally confused for an actor who twice married Melanie Griffith, that is if anybody but us bothers thinking of him at all. Lynn may not have been a potential game-changing star with the ability to score countless hits and be a leader in the rock field for years to come but he DID have the ability to at least make a good career out of this for awhile and help bolster rock’s arsenal with some solid performances. Instead his career was stillborn through no fault of his own. As we’ll see here over the next seven plus decades rock history is littered with those who failed to connect and lived out their days in anonymity but who always believed they were on the brink of success if not for the machinations of their record labels ceasing to distribute something bound for glory, or to promote a surefire hit record properly just as it was about to take off. All of those people – or at least most of them – are pretty much delusional. Clinging to a far-fetched notion to soothe their battered ego and explain away their failure in a way that takes the onus off their own shortcomings as an artist. 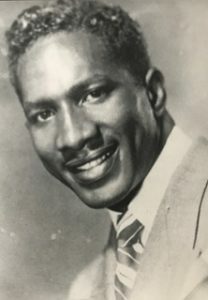 But every once in awhile those claims have some merit, and in the case of Smilin’ Smokey Lynn, while being a star was never assured, he was unquestionably shortchanged by circumstances out of his control. Leave a reply on "Smilin’ Smokey Lynn: “Lonesome Lover Blues”"